SUMMARY: According to the MarketingSherpa Ecommerce Benchmark Study, technology is the top barrier to growth for companies with high revenue. 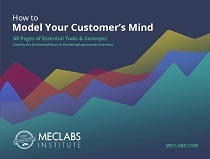 Keeping that in mind, the data scientists at MECLABS Institute, MarketingSherpa's parent company, reviewed a data set of 208,551 answers in a Web-based email service provider (ESP) selection tool from ClickMail to determine what marketers are looking for in their technology. Read on to see their responses, along with expert advice to help you make your own technology selection and implementation more successful. In ClickMail's ESPinator tool, marketers are asked to rank technology features from "completely unimportant" to "must have." As you can see in the chart above, 78.54% of respondents that rated "an interface that requires very little training" a "must have" also said that robust reporting and analysis tools were a "must have." 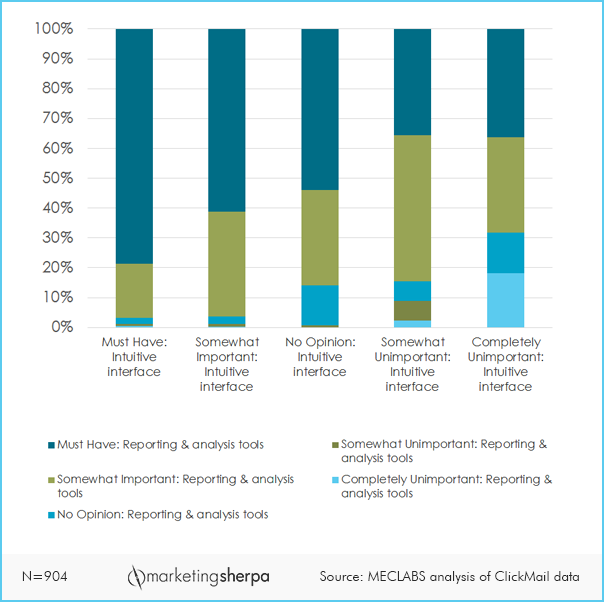 The majority of respondents rated robust reporting and analysis tools a "must have" but felt less strongly toward having an intuitive interface. In other words, most marketers who are looking for an email service provider (ESP) wish to gain deep insights into their data from that ESP, but they don't want to have to work hard to get those results. "Many ESPs have done a great job, over time, of optimizing their interfaces while they add new functionality. The net result is fairly simple interfaces with robust capabilities," said Marco Marini, CEO, ClickMail. "Reporting, however, is different. There is still a big gap between the average ESP reporting interface and the other technologies that exist for data visualization. The other very important part of this equation is having the right person to interpret the data and make intelligent decisions based on (the data)." "The biggest mistake we see are marketers not understanding or delineating between need and want. And want, more often, trumps need, which then often leads to the organization looking for its next 'best' ESP once the contract with their current 'best' ESP is up," advised John Caldwell, Principal and Founder, Red Pill Email. He added, "Experienced marketers put functional needs before nonfunctional wants when selecting an ESP. Too many marketers select a vendor based on what they think (or have been told) is 'easy' by someone that finds a particular vendor easy for them." Understand that the data in the above chart is directional at best. Terms like "robust" and "easy" are relative and very open to interpretation — both from this data and advice you get from your network. When you're identifying what you need in a technology implementation, make sure you have clearly defined exactly what your team needs. When working in IT, I used to joke that many technology companies act like software is magic and will solve all of your problems. In reality, software is a tool and will only be as effective as the craftsman that wields it. According to Caldwell, it is important to "Inventory all messaging campaigns and associated business rules; extract functionality from any business rules or use cases, then ask each interested party or department — including technology and DBA (database administration) — what their functional needs may be." "Divide all specifications into functional and nonfunctional specifications then reduce them down to core functions," he added. "For example, if you have seven instances where a message is triggered when the recipient completes a form, you don't want (or need) to list all seven applications, just the core feature of 'form-triggered messages.'" This deceivingly simplistic step is of utmost importance. In order to fix the problem, you need to specifically identify what parts and processes are causing said problem and whether it is possible to change them. Get your IT department involved in the selection process to provide an understanding of how the new technology must interact with the platforms and technology currently used in your organization. Find out what functionality they currently have that is essential, what functionality they aren't using and what functionality would help them become more effective. That last part will help you keep backend usability considerations in mind. To address the above chart, this is where you have to understand the sometimes necessary tradeoffs between ease-of-use and robust capabilities. "The more layers of 'easy,' the further you get from 'robust,'" Caldwell advised. He explained, "For example, a drag-and-drop query or filter feature most often nests multiple SQL [structured query language] commands beneath the drag-and-drop layer. You can only nest so deep with drag-and-drop (or even a wizard) before queries become inefficient or questionably stable. A coded or written SQL statement directly into the platform will be much more efficient if for no other reason than eliminating all of the layers required to support 'easy.'" "After you've collected both functional and nonfunctional requirements and reduced them to core functions, prioritize them," Caldwell said. "This will help you to narrow down prospective ESPs by eliminating those that don't meet your requirements and short-list for deeper review those that do meet your requirements." What is the expected ROI from it? The ESPs you narrow in on should powerful — after all, they will be a key driver of all of your marketing plans — yet flexible enough to allow for the changing needs of your organization. In other words, be open. There are many ways to solve problems, and you will understand them more as you explore the different options available to your team. According to Caldwell, "What people should look for in selecting the right ESP for their organization is the one that most closely meets their functional and non-functional requirements, followed by the ESP that most closely resembles their organization's culture." "If you're with a laid-back organization, a frenetic ESP will make you nuts; and the same in reverse," he added. "If a vendor has 98% of what you want and need, but there is a culture clash between the organizations, while functionally everything may work the relationship will likely be a struggle — and there's always another vendor with a similar culture that still covers 98% of what you need and want." "Cost seems too often drive the decision process, but I would focus on which solution provides you with the best implementation of your current and future needs," Marini added. "ROI should be a factor in selecting the right tool more than just the cost of the tool itself. With the right tool, you will inevitably see a higher ROI on the back end." Technology implementation is important here, but understanding who will be working with the technology and how will they do it is important as well. This goes beyond your own team and could include your ecosystem of agencies and consultants. Reporting is one example where it is important to understand how the implementation will work in your corporate environment. "Many companies export their data to external, more powerful reporting platforms," Marini said. "The challenge is that they are not typically integrated and thus require manual intervention. There are some great email-focused companies that can do this for you if you don't have the internal resources." Also, thinking about how to prepare your marketing team for this new change can help ease in a new technology platform. "Here's the thing," Caldwell said, "without knowledge of how ESPs work, none are 'easy' until you've learned how to use them, and the learning doesn't come until after the platform training." "If tasks are basic and repetitive, it's much cheaper (and easier) to just learn the platform than to try to find ways around not learning the platform," he advised. Have further technology questions? Caldwell and Michael Kelly of ClickMail Marketing will be speaking in the "Quick Tips: Technology selection" session at Email Summit 2015 in Las Vegas.